You might be forgiven for wondering what is going on in this photograph. 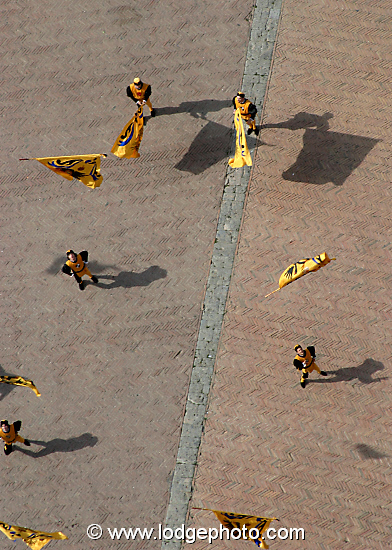 It is a vertical view down onto the heads of a bunch of grown men in medieval yellow silk outfits waving large flags in Siena, Italy. You can only tell they’re men and flags by the shadows, which is part of the appeal in this photograph. But what on earth is going on? Flag throwing is a very serious business in Siena: it is part of a larger social structure called Contrade that has lasted for hundreds of years. The city is divided into regions, each one the territory of a Contrade -- originally these had a military purpose: to help defend against the hated Florentines. In modern Siena there are 17 contrade, but in medieval Siena there were more: six are remembered as the "suppressed contrade"; they disappeared when the plague decimated the city's population. Every citizen of Siena is a contrade member, determined by place of birth or "inherited" from parents. As one Sienese ("Senesi") tried to explain it to me, a contrade is like a large extended family. I was also told that non-Senesi cannot really comprehend what it means to be a member; after several glasses of Chianti I felt I was definitely getting closer to understanding. Contrade have a church or chapel and headquarters (where Palio trophies are jealously guarded), a patron saint, a symbol or insignia and, of course, colors and a flag. Active members are passionate about their contrade, and flag throwing is a way of expressing this. It's part of the ceremony around the famous horse race, Il Palio, and a way for contrade to show off. In the picture, you see members of the Aquilla (Eagle) Contrade practicing in mid June, getting ready for the Palio. The photo was taken from the top of Siena's town hall tower with a long lens to get the angle and shadows. Luck played a major part in this as I'd just reached the top when I leard the drum beat of the Aquilla as they marched from their part of the city into Il Campo, the main square.